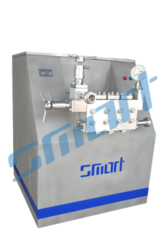 Leading Manufacturer of chemical homogenizer from Coimbatore. Our company is fast emerging as the leading manufacturer and supplier of Chemical Homogenizer which are available in various sizes and specifications. These are heavily used in chemical industries and fabricated by our trusted expert team using supreme quality of raw materials. We have many varieties of this homogenizer as per our customer needs. Apart from this, these are highly reliable and are available at competitive prices to our clients. Looking for Chemical Homogenizer ?